Okay, I know I said I would do this on Mondays but there are too many great works in the thread, and too few Mondays left in December, so: Another highlight in the “Show Us Your Tentacles” Cthulhu art jam post. This one from Susan Sanford. Cthulhu and Mr. Hulot!!! It is a wonderful life world we live in. Sanford is offering this image (along with a lot of other cool writer-y themed drawings) as a t-shirt here. 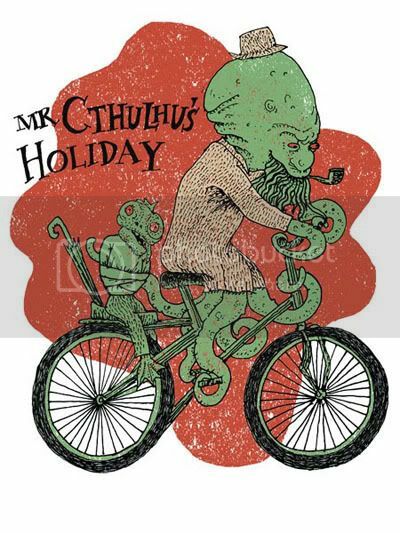 And, be sure to check out, and add to, what I will declare (completely without research or scholarship to back it up) is the coolest collection of pro and fan Cthulhu art online. Wow! Thank you! I always wanted to write in my site something like that. Can I take part of your post to my blog? Please come visit my site Directory Jacksonville City when you got time.